Last week's hearing on the allegations against Brett Kavanaugh brought up, among other things, the high-school party scene in the 1980s and the films that glorified it. Brett Kavanaugh mentioned those movies when he defended some of the crude references in his high school yearbook. BRETT KAVANAUGH: I think some editors and students wanted the yearbook to be some combination of "Animal House," "Caddyshack" and "Fast Times At Ridgemont High," which were all recent movies at that time. GARCIA-NAVARRO: After that raft of movies came others, including the famous teenage comedies of John Hughes, like "Sixteen Candles" and "The Breakfast Club." Molly Ringwald was a star in many of those movies. And she's written about how she has reassessed them. And she joins us now to talk about that. Welcome. MOLLY RINGWALD: Thank you, Lulu. GARCIA-NAVARRO: So you starred in many '80s comedies of the kind that Kavanaugh cited. What did you think when you heard him use that as a defense? RINGWALD: You know, when I made those movies with John Hughes, his intention was to not make "Porky's" or "Animal House." But I think, you know, as everyone says - and I do believe it's true that the times were different. And what was acceptable then is definitely not acceptable now, and nor should it have been then. But that's sort of the way that it was. And as everyone knows, I feel very differently about the movies now. And it's a difficult position for me to be in because there is a lot that I like about them. And, of course, I don't want to appear ungrateful to John Hughes, but I do oppose a lot of what is in those movies. GARCIA-NAVARRO: You know, some of the things that are being reassessed now specifically are films like "Sixteen Candles." You know, the dreamboat for many women for so long was Jake Ryan, the love interest who at one point dumps his unconscious and drunk girlfriend Caroline to another guy and says, you know, have fun. And people may remember this movie fondly. But let's play some tape for those who might not have seen it in a while. This is a scene where Jake is talking about Caroline as she's passed out. MICHAEL SCHOEFFLING: (As Jake Ryan) I can get a piece of [bleep] anytime I want. [Bleep], I got Caroline in my bedroom right now passed out cold. I could violate her 10 different ways if I wanted to. GARCIA-NAVARRO: You know, Molly, you have written about seeing that film again with your daughter and sort of looking at that in a different way many years later. RINGWALD: Yeah, I do see it differently. I mean, there were parts of that film that bothered me then. Although everybody likes to say that I had, you know, John Hughes' ear, and he did listen to me in a lot of ways, I wasn't the filmmaker. And, you know, sometimes, I would tell them, well, I think that this is kind of tacky. Or I don't - I think that this is irrelevant. Or this doesn't ring true. And, you know, sometimes, he would listen to me. But in other cases, he didn't. And, you know, you don't want to speak up too much. You don't want to cross the line. Or at least that's the way that I felt at the time. GARCIA-NAVARRO: Were these films a reflection of the culture that already existed? Or was it like a feedback loop where they were sort of holding up a mirror to something and then feeding into the way that, you know, women were perceived and treated? RINGWALD: I feel like that's a really interesting question. I'm not sure that I know the answer to that. I know what my own experience was. I feel like the movies that I made then were very much representing the culture at the time. You know, and I feel like that is why they resonated with people - because it was their experience. And they did feel like they had these films that were real. They weren't - they didn't have that sort of after-school special feeling where somebody was, you know, teaching them a lesson. You know, it didn't feel like that. GARCIA-NAVARRO: How should we look at these films now? I mean, when we're in the midst of this conversation about the culture in the '80s and how that may have impacted something that's happening today, how do you think we should look at them now? RINGWALD: I believe that there is still a lot of good in the films. And there's a lot that I'm proud of. And I feel like in a lot of ways they've touched teenagers and sparked a conversation that is important. And having a teenage daughter myself, I know that it's not always easy to get teenagers to talk. But these films sort of break through that. You know, there is something that really touches teenagers, especially "The Breakfast Club." I feel like sort of gives them permission to talk about their feelings, says that teenagers' feelings really matter. And I think that's a really powerful message. And for that reason I really love it. "Pretty In Pink" - I love my character. I think that she's a strong woman. And I'm proud of the choices that she makes. GARCIA-NAVARRO: You, though, have been apart recently of, you know, projects that many have hailed as getting difficult conversations, right? I'm thinking of "Riverdale" in particular about how they dealt with sexual violence, giving girls agency over that. Who's doing it right in your view? RINGWALD: One comes to mind which is "Eighth Grade." I thought it was a beautiful movie. And it also seemed very true. I mean, raising a teenager who just graduated from eighth grade - she just started ninth grade. You know, there there is a lot that really rang true for me. And it seemed to borrow a lot from John Hughes. But for me, it sort of borrowed the best part from John Hughes. 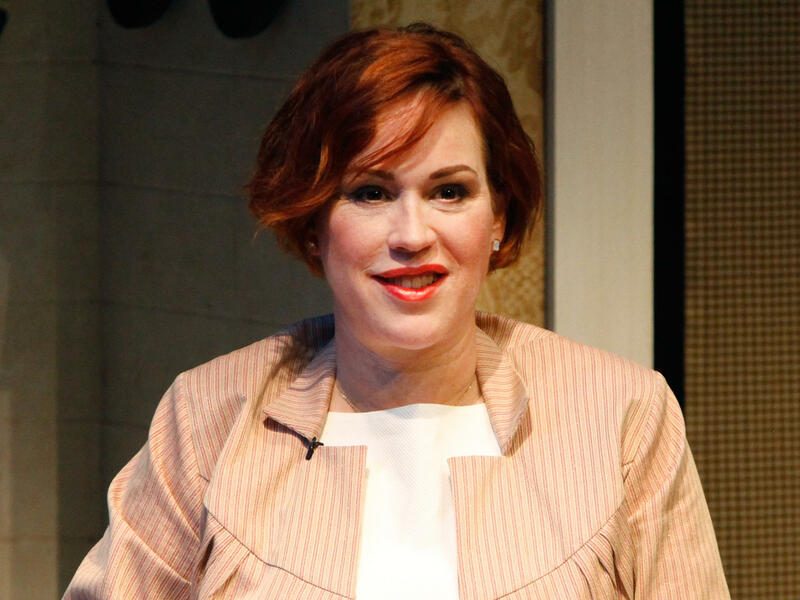 GARCIA-NAVARRO: Molly Ringwald, actress, author and icon for Gen Xers like me, thank you very much. (SOUNDBITE OF LVGOON'S "WHEN ALL IS OVER") Transcript provided by NPR, Copyright NPR.